This Apple Chicken Recipe is so delicious. 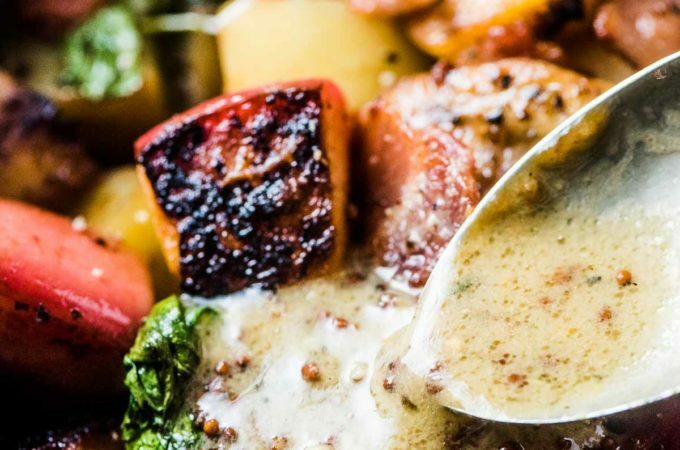 It’s made in one pan with bacon, potatoes, spinach, and a simple honey and grainy mustard sauce. It’s an easy to make and healthy recipe perfect for apple season! Turn your oven on to 375 degrees. Cook the bacon in a large, ovenproof frying pan over medium heat until it’s crispy, about 10 minutes. Remove it from the pan with a slotted spoon. Turn the heat up to medium-high. Add the apples to the pan and let them cook until they turn golden brown, about 5 minutes. Remove them from the pan and put them with the bacon. Season the chicken thighs with the salt and pepper and add them to the pan. When they are brown on one side, remove them from the pan. Add the cider or chicken stock, the dijon, grainy mustard, and honey to the pan and whisk. Add the potatoes and stir them through the sauce. Nestle the chicken thighs into the potatoes, browned side up. Cover the pot and put it into your oven to cook for 30 minutes. Remove the cover from the pot and let it cook for 15 minutes more. Remove the pot from the oven and add the bacon, apples, and spinach. Pop it back in your oven for 5 minutes to wilt the spinach.